Other than the iconic first chord of ‘A Hard Day’s Night’ at the beginning of the movie, there is no mention of The Beatles in Nowhere Boy, which is fitting. After all, the film is not about the Beatles, but a teenaged boy by the name of John Lennon growing up aimless and angry, and how he found passion and poured his life into a goal that finally led him to become one of the most important music figures of our time. An apt title. Lennon had had a tumultous childhood. Raised by his aunt Mimi since five years-old, he did not meet his birth mother again, Mimi’s younger sister Julia, until he was 15. The film picked up from there until he went to Hamburg in 1960. Screenwriter Matt Greenhaigh had crafted a moving relational story based on the book written by John Lennon’s half-sister, Julia Baird, entitled Imagine This: Growing Up with My Brother John Lennon. I’ve particularly enjoyed the mother-son relationship depicted so poignantly in the movie, and the tug of war between the one who has given birth to and the one who has raised the child. 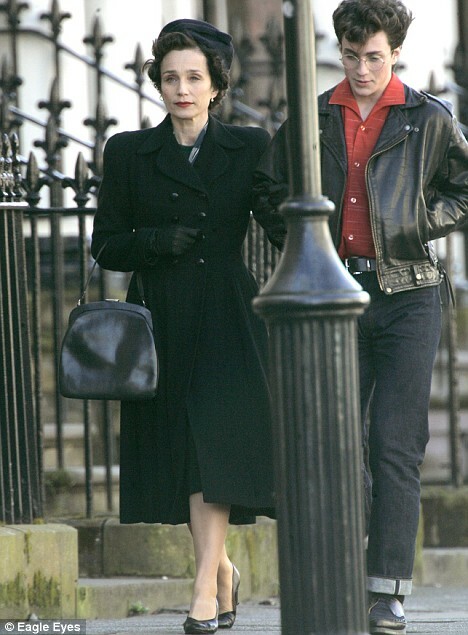 For me, there is also a bit of competition, comparing the two amazing actors, Anne Marie Duff as Julia, Lennon’s birth mother, and Kristin Scott Thomas, as Aunt Mimi, who has raised the boy, stayed with him through thick and thin, and watched him emerge into a man of importance. Everyone who watches a movie does so from his/her own frame of reference and perspective. While I’ve enjoyed the pre-Beatles era music and the early rock and roll in the film, as well as the human interest of youth striving to gain some sense of self, I’m nevertheless drawn to Scott Thomas’s role as Aunt Mimi. She has shown what a mother is, even though she is not the one who has given birth to John. She is someone who stays and not escapes, who takes care of daily tedium, who instills the ever unpopular notions of discipline and responsibility, and who takes nasty insults and hurting actions from a rebellious and still maturing teenager, all because of love. Scott Thomas’s marvellous performance as the strict and stern Mimi is an effective foil against Duff’s frolicking Julia. Both performances are moving. Aaron Johnson has done a marvellous job in portraying a tormented soul torn between these two women. Meeting his birth mother Julia at 15, he can feel right away the thickness of blood. On the outset, his musical talent has come from Julia, and his free spirit a natural extension of hers, yet he knows he is also tied to Mimi, and despite her restrained persona, he knows she has loved him deeply. On his first gig as the Quarrymen, John is introduced to a fifteen year-old well-mannered teen by the name of Paul McCartney, nicely played by Thomas Brodie Sangster. Again, an effective foil between the two. Paul is gentle, polite, chooses tea over beer, and does not have to bust and bang to release his pent-up emotions. He also helps John with his guitar skills, teaching him more chords, and suggesting they write their own songs. Paul definitely has it all collected under a stronger self despite the loss of his own mother just a year earlier. Thus marks the beginning of a valuable friendship. The fine production is significant considering it is a fact-based biopic of a period of Lennon’s life that has not been explored on film. Cinematographer Seamus McGarvey (Atonement, 2008) has crafted some colorful renditions for this period film. The two sisters are also color-coded, Julia in red and pink, and Mimi, back and grey. A bit too dramatic at times, but the point well taken, maybe something to do with director Sam Taylor-Wood being a visual artist before this her first feature film. Also, some scenes may look melodramatic, but I was so immersed in the story I had thoroughly enjoyed them. The most moving scenes come at the end, and all the way through the credits. That is when real photos and actual historical accounts are revealed, a poignant resonance to the film. At the beginning of the end credits, we see that the film is dedicated to Anthony Minghella (1954-2008), the Oscar winning director who had brought us the The English Patient (1996), Cold Mountain (2003) and The Talented Mr. Ripley (1999), to name a few. Minghella was instrumental in encouraging director Sam Taylor-Wood to make the transition from visual artist to filmmaker, and had worked with her on her short Love You More, which has earned her a nom for the Golden Palm at Cannes 2008. Nowhere Boy garnered four BAFTA nominations including Outstanding British Film and Outstanding Debut Director for Sam Taylor-Wood. Both Scott Thomas and Duff were nominated for BAFTA and The British Independent Film Awards, which Duff won, as well as the London Critics Circle Film Awards. Johnson’s impressive performance also led him to noms and wins. Overall, a moving tribute to a pop icon and the two mother figures that had shaped his early life. I’m reminded of how terribly out of it I am when it comes to movies these days. I hadn’t even heard of this. But after reading your tremendous review, I will. It really sounds beautiful, and i am drawn to bios these days. I love KST, and Minghella, so with those two connections alone I am drawn to this. But everything else you wrote is beautifully inspiring as well. Thank you for taking your time and skill to share this film. I look forward to it. Was it in the theater? I’ll look for it on Netflix if not. I don’t think this 2009 British indie film had any promotion here in N. America, at least not the amount that it deserved. I’ve been waiting for it since last year and finally it has its limited release last week in my city, only in an indie movie theatre, definitely not your shopping mall Cineplex. You’re not too “out-of-it” Ruth, at least you’ve appreciated KST and Minghella 😉 But I don’t think the DVD is out yet, or whether Netflix has it. But yes, by all means, look for it. I’m sure you’ll really enjoy it, for the music, for the history, for the exploration of what defines motherhood. The film’s U.S. release was on October 8, coinciding with the 70th anniversary of Lennon’s birth (on October 9) but there was a sneak preview on September 24 in the little town of Rosendale, NY, which also featured the surviving members of The Quarrymen. Thanks for the info. Today Dec. 8, 2010 is the day Lennon was shot 30 years ago. 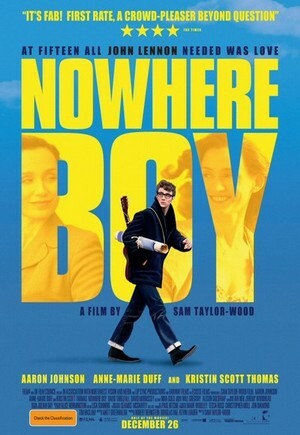 Nowhere Boy is a fine tribute to ‘the making of’ a pop icon. Reading this, I was astonished to realize how little I’ve known of Lennon’s actual biography. In fact, I know almost nothing. I “met” the Beatles when they emerged onto the stage on the Ed Sullivan show, and for years afterward, I perceived them as a single organism. What strikes me about this story, and what makes it seem worth seeing, is the exploration of the aunt/mother dynamic. You may remember how important my Aunt T was to me (she’s the one who resembled Julia Child and gave me my jeweled elephant). Today, my mother’s youngest sister, my favorite aunt of all, still is living, and she’s been quite important to me in ways that are hard to describe. “Aunt” and “Uncle” seem to be given short shrift in our society – I’ve seen few explorations of what it means to have that relationship. This would be an interesting – and entertaining – place to begin thinking about the subject. I’ll bet the music is great, too! I went into the movie theatre with no knowledge of Lennon’s past. And that’s why I found the story so poignant. The moving scenes I keep them for your viewing pleasure so I purposely didn’t give out any hint here. The film is much more than what I’ve said in the post. Do look for it when it comes out on DVD or on Netflix. BTW, Yoko Ono was at the film’s premiere in NYC. She’d endorsed it and had provided photos for the production. And yes, I remember your post about your Aunt T, and her resemblance to Julia Child. It’s such an interesting post. Well I think in your case, the relationship is much more amicable than that depicted in the film. Again, without prior knowledge of Lennon’s past, the story carries a greater impact. Ah! Now I’m even more eager to see it! Ah, definitely a movie that HM will go see with me. I don’t know where it is in the city, maybe it’s been and gone, but I’ll look for this weekend. Great review. And great topic/subject for a movie. At last. You won’t believe the movie I dragged HM to see. (Yup, Morning Glory. But honestly, we needed some lighthearted entertainment. And I told him it would be totally ok if he fell asleep.) I give it a 7.5. And as a rental, because it will be one day, I’d give it a 10. Also has a good soundtrack. You know, I was thinking of Morning Glory but decided to wait till it goes to the second run theatres. Instead I saw the third installment of the “Girl” trilogy: The Girl Who Kicked the Hornet’s Nest. It’s a good wrap-up although it lacks the thrills of the first one, which is the best of the three. Nowhere Boy is a must-see if you’re a Beatles fan. But as I said in my post, it’s all about a young John Lennon. I know the DVD is coming out next January. Hope you can catch it in theatres. What a great review! I sort of like Beatles music, not enough to go to a film that celebrated it, but this biopic of John Lennon sounds extremely well done. I really liked Sam Taylor-Woods’ visual art – her photos of famous men crying were particularly striking. I can imagine her creating a poised and emotionally intriguing film. Welcome! Yes, this is a fine production… and you don’t have to be a Beatles fan to enjoy it. Further, since you know of STW’s visual art work, it’ll be interesting to see how she transposed her talents from one genre to another. Thank you for stopping by and leaving your comment.